After almost a year of preparation, the Federal Highway Administration took the message of Every Day Counts—an initiative to deploy innovation aimed at shortening project delivery time, enhancing roadway safety and protecting the environment—to a nationwide audience via 10 regional innovation summits. The two-day summits provided state transportation agencies and others in the highway community with an overview of the Every Day Counts effort, as well as detailed discussions on several technologies and techniques designed to assist them in shortening the time it takes to deliver highway construction projects. Summits were held in California, Colorado, Georgia, Illinois, Massachusetts, Minnesota, New Mexico, New Jersey, Virginia, and Washington State. "We were encouraged by the way our partners embraced these concepts," said FHWA Deputy Administrator Greg Nadeau. "Many of the states already use one or more of the innovations, but there are at least one or two that are new to just about everyone." Every Day Counts had its genesis from the discussions FHWA Administrator Victor Mendez had with government leaders during preparation for his 2009 Senate confirmation hearings. In his first video conference with FHWA employees, he remarked that several of the lawmakers asked him why it takes so long to complete a highway construction project. The administrator took those questions to heart and vowed that reducing the project delivery timeframe before his tenure with the agency ends would be his primary goal. Thus, the Every Day Counts initiative was born. Prefabricated bridge elements and systems—With prefabricated bridge elements and systems, many time-consuming construction tasks no longer need to be done sequentially in work zones. An old bridge can be demolished while new bridge elements are built at the same time off site, then brought to the project location ready to erect. Because PBES are usually fabricated under controlled climate conditions, weather has less impact on the quality, safety and duration of the project. 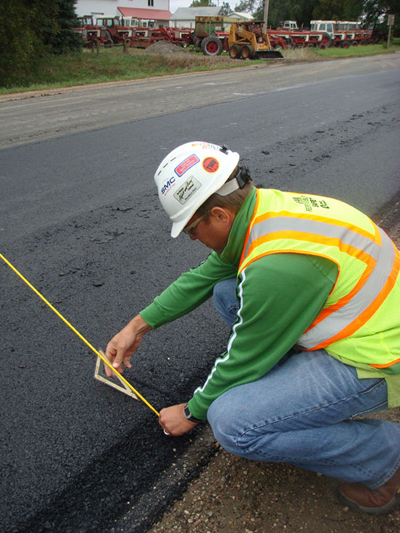 The safety edge, a simple, cost-effective paving technique that helps save lives, is one of the technologies FHWA teams are accelerating through the Every Day Counts initiative. Safety edge—This innovation is a simple but extremely effective solution that can help save lives by allowing drivers who stray off highways to return to the road safely. Instead of a vertical drop-off, the safety edge shapes the edge of the pavement to 30 degrees. Adaptive signal control/ACS-Lite—Poor traffic signal timing contributes to traffic congestion and delay. Conventional signal systems use preprogrammed daily signal timing schedules. Adaptive signal control technology adjusts the timing of red, yellow and green lights to accommodate changing traffic patterns and ease traffic congestion. Adaptive Control Software Lite is an example of adaptive signal control technology. ACS-Lite was specifically designed to be deployed using conventional control equipment, communications and traffic sensors on arterial streets, making it a cost-effective alternative to other signal timing adjustment technologies. Warm-mix asphalt—Warm-mix asphalt is the generic term for a variety of technologies that allow asphalt to be produced and then placed on the road at lower temperatures than the conventional hot-mix method. WMA production is at temperatures ranging from 30 to 120 degrees lower than hot mix. In most cases, the lower temperatures result in significant cost savings and reduced greenhouse gas emissions because less fuel is required. WMA also has the potential to extend the construction season, allowing projects to be delivered faster. By 2009, more than 40 states had constructed WMA projects and 14 had adopted specifications to accommodate WMA. 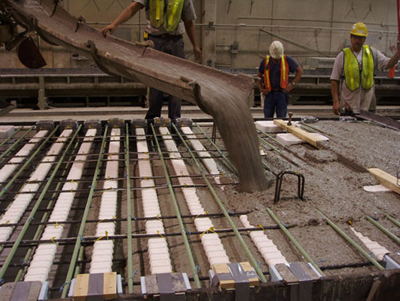 Geosynthetic reinforced soil—Instead of conventional bridge support technology, geosynthetic reinforced soil technology uses alternating layers of compacted granular fill material and fabric sheets of geotextile reinforcement to provide support for the bridge. GRS also provides a smooth transition from the bridge onto the roadway, and alleviates the "bump at the bridge" problem caused by uneven settlement between the bridge and approaching roadway. Once these five technologies were identified, teams of professionals were formed to assist in their deployment. The "Leap Not Creep" training course developed by the National Highway Institute under the auspices of the Highways for LIFE program was used to provide guidance to the teams in focusing their efforts on their targeted customers. The course was followed up with retreats where the teams could develop strategies, action plans and communication tools. Both the course and the retreats had been field-tested under the Highways for LIFE program. "Highways for LIFE is all about changing culture," said Byron Lord, Highways for LIFE team leader. "It's rewarding to see that these approaches will become standard practice for our agency as it strives to be a leader in advancing innovation." With the teams and their plans in place, it was time to form the partnerships within the rest of the highway community. The first of the regional innovation summits was held in September in Virginia. The last one was finished in December in Atlanta. Nadeau has charged state departments of transportation to take ownership by creating a network of state implementation and deployment teams to bring many of these initiatives into standard practice. "After so much time and effort invested, it's good to finally begin getting these new approaches to the people who will put them into practice," said Nadeau. 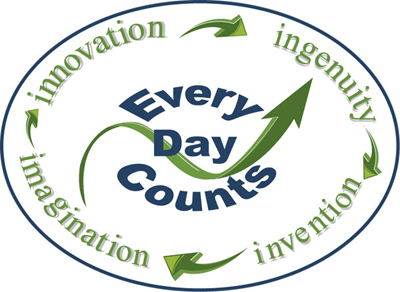 For more information about the Every Day Counts initiative, contact a state FHWA Division or visit the initiative's website at www.fhwa.dot.gov/innovation/everydaycounts/. Many leaders of transportation organizations—both government agencies and private sector firms—have seen the need to use a new technology or innovation for solving problems. And they've helped shepherd it through the various organizational requirements to get it to the point of being a standard practice. But then another one comes along, perhaps in a different area of the organization, and they work to get that one into use, too. Before long, it has become clear that rather than slogging through a morass of bureaucracy and cries of "that's not the way we've always done things around here," what's needed is a dramatic change within the organization itself. Leaders want a culture that's more open to innovation. They want an organization that's nimble, able to quickly shift practices or even strategic direction, and still execute its operational objectives. Several transportation organizations have actually done this and are already reaping the benefits. They are able to anticipate, adapt to and react decisively to events in the business environment. Others continue to change on a piecemeal basis without organizational commitment to change. Rather than a scene from science fiction, this scenario is what General Motors researchers believe the highway system could be in coming decades. It symbolizes the major cultural, environmental, and political changes the highway community is addressing. For leaders who see transformational change and the ability to rapidly embrace new ideas and processes as something they're interested in, a special workshop at the Transportation Research Board Annual Meeting in January 2011 is aimed at meeting this need. A blue-ribbon panel comprised of leaders across the highway community—federal and state transportation agencies, design consultants, construction firms—will discuss how they are dealing with the need for change. There will be suggestions to use and pitfalls to watch out for. To set the stage, the opening presentation will feature General Motors Director of Advanced Technology Vehicle Concepts, Dr. Christopher Borroni-Bird. He will discuss the need for what he calls "a new DNA" for the automobile. As coauthor of Reinventing the Automobile, Borroni-Bird is on the cutting edge of where automobiles are going in the future. He will offer a scenario that many feel has real potential for the next 10, 20 or 30 years. It is also an iconic representation of the many environmental, cultural, political and technological changes going on every day. But the challenge is: how do highway organizations change to meet the demands of such revolutionary concepts? And how do leaders begin now to make changes in organizations so that they are nimble? Leaders in all the major facets of the highway community will follow with discussions of how they are reinventing organizations to meet the rapidly changing transportation landscape. Thomas Sorel, commissioner of the Minnesota Department of Transportation, will represent state transportation agencies. Representing the perspective of design consultants will be Hal Kassoff, senior vice president and principal professional associate with Parsons Brinckerhoff. Dr. T. Peter Ruane, president and chief executive officer of the American Road and Transportation Builders Association, will provide comments representing the construction community. Victor Mendez, administrator of the Federal Highway Administration, will address the federal government's perspective. Highways for LIFE Team Leader Byron Lord will moderate the workshop, as well as a panel discussion and question-and-answer session that will be held after all the speakers have given their initial presentations. "If we are to continue to provide the quality of transportation service for the future, it is essential that we embrace a new culture that actively seeks better solutions and works together to deploy them as standards of practice as quickly as possible," said Lord. "We need to make this a norm of professional and organizational conduct." The workshop, "Highways for LIFE: What Does it Take to Change How We Do Business?" will be held at the Marriott Wardman Park Hotel on the last day of the Transportation Research Board meeting in Washington, D.C., on Thursday, Jan. 27, from 8 a.m. until 12 noon. For more information, contact Julie Zirlin at Julie.Zirlin@dot.gov or 202-366-9105. Using accelerated bridge construction enabled the Iowa Department of Transportation to replace a bridge in one construction season instead of the two required for traditional construction methods, reducing traffic disruption and saving money. "The Iowa DOT gained considerable experience with the innovations used on this project and, because of the success, is encouraged to include these innovations on future projects," according to Iowa Demonstration Project: Improvements to the 24th Street–I-29/80 Interchange in Council Bluffs, a Federal Highway Administration report on the project. No motorist incidents or worker injuries were reported during construction, which means the Iowa DOT met the Highways for LIFE performance goal for safety on the project. A key project feature was accelerating work to span just one April-to-October construction season, eliminating hazardous winter driving conditions through the work zone. The shortened work schedule cut construction impact on traffic flow from 16 months to less than 6 months, surpassing the Highways for LIFE goal of reducing construction time by half. A travel-time study found that construction had no measureable impact on trip time on I-29/80 in the vicinity of the project. Smoothness across the bridge was dramatically increased, with the International Roughness Index measurement dropping from a preconstruction value of 199 inches per mile to 86 inches per mile after the project was finished. In addition, the pavement noise level showed a substantial drop after construction. The project featured a public outreach strategy that included meetings to gain input from the public and provide construction updates. The highway agency also distributed newsletters at key points throughout the project and met with area businesses affected by the reconstruction. A website provided background on the project and updates on construction activities, road closures and detour routes. The highway agency chose precast bridge deck panels made of self-consolidating concrete to speed construction and enhance safety and quality. A post-construction survey of the traveling public and area businesses found that satisfaction with the project exceeded the Highways for LIFE goals. Ninety-seven percent gave high scores to the importance of the approach used to keep traffic flowing while the project was built, and 89 percent gave good to very good marks to the way the project was carried out. The costs and benefits of the project were compared with those of a project of similar size and scope delivered using a more traditional approach. The economic analysis revealed that the Iowa DOT's approach resulted in a cost savings of about $1 million—8 percent of the total project—over conventional construction practices. A significant amount of the savings stemmed from reduced construction time. To read the Iowa and other follow-up reports on Highways for LIFE demonstration projects, go to www.fhwa.dot.gov/hfl/projects. For more information on accelerated bridge construction, see www.fhwa.dot.gov/bridge/abc/index.cfm. 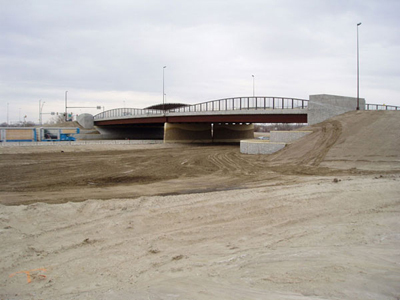 Iowa's Highways for LIFE project to replace the 24th Street Bridge in Council Bluffs is a top-10 winner in the 2010 America's Transportation Awards competition, sponsored by the American Association of State Highway and Transportation Officials, AAA and the U.S. Chamber of Commerce. The top-10 projects scored the highest number of overall points during four regional contests. Forty-three projects in 29 states were judged in four categories: "Best Recovery Act," "On Time," "Under Budget," and "Innovative Management." The top-10 winners competed for America's Transportation Awards' Grand Prize, selected by a panel of judges, and the People's Choice Award, decided by popular vote at the https://americastransportationawards.org/ website. The awards were presented to the Missouri and Mississippi DOTs at the AASHTO Annual Meeting in Biloxi, Miss., in October. 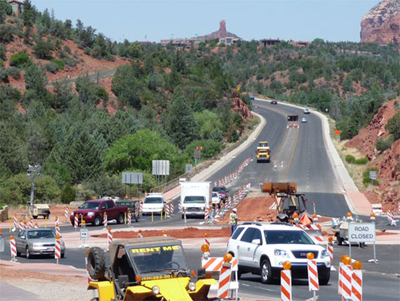 "These projects are making travel smoother, safer, and less congested for millions of motorists every day," said John Horsley, AASHTO executive director. "We know that taxpayers understand the value of quality transportation and this contest shows how wisely and how well states are investing their limited resources." The Iowa project earned top honors in the "On Time/Small Project" category in the Mid America Association of State Transportation Officials regional contest. The project "employed innovative design, creative contracting, and accelerated construction techniques which allowed the bridge to be replaced while keeping the busy interchange open," according to an AASHTO news release. "Well-planned construction staging and intelligent transportation systems ensured that traffic capacity was maintained throughout the process, minimizing the effects on the surrounding community and businesses." LTAP/TTAP Competition Seeks "Better Mousetraps"
"Build a better mousetrap, and the world will beat a pathway to your door." That notion of finding a better way of doing business—paraphrased from 19th century writer Ralph Waldo Emerson—is embodied in the national Build a Better Mousetrap Competition sponsored by the Local Technical Assistance and Tribal Technical Assistance Programs coordinated by the Federal Highway Administration. The national competition began two years ago, but individual LTAP/TTAP centers have been holding similar competitions for years, according to Clark Martin, FHWA workforce programs coordinator. "Although it's a fairly new competition, Build a Better Mousetrap has already demonstrated how very innovative our local and tribal agencies are when it comes to finding ways of doing their jobs safer, faster, better and at less cost to the taxpayer," said Martin. Individual LTAP/TTAP centers—which serve states, Puerto Rico and tribal governments—submit winners of their competitions to the national contest to vie for prizes and bragging rights. Development of a trailer to transport large tires from heavy equipment won Towner County, N.D., top honors in the Build a Better Mousetrap National Competition. The program's goal of promoting low-cost, high-payoff innovations and recognizing those who create them is exemplified by the 2010 first-place winner, "Large Tire Trailer Transport," developed by Towner County, N.D., and submitted by the North Dakota LTAP program. The county has motor graders and front-end loaders throughout its geographic area, and whenever the tires on these machines need repairs, the tires must be transported to the maintenance shop. The old method for transporting them required at least two workers to load them into a pickup truck, and the heavy lifting created a potential for injury. The solution? 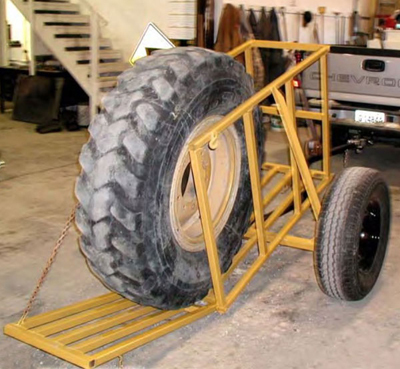 The county developed a small, 5-foot-long (1.5-meter-long) trailer that could hold individual tires for transporting to the shop. The trailer's hinged tailgate makes it possible for a single person to roll the tire onto and off the trailer, greatly reducing the potential for injury from lifting. Materials for the trailer cost around $600, and county employees built it in the shop during downtime. Another 2010 winner is a spring-loaded post holder developed by Buffalo County, Neb., that mounts on bridges and holds object markers. In the past, farm equipment crossing rural bridges often knocked out markers or equipment drivers had to weave around them, creating a hazard for other drivers. Installation of the new spring-loaded devices, which cost $32 each, eliminated the problem. Other examples include the San Luis Valley Rural Electric Coop in Colorado, which developed a program of safety cones designed to prevent crashes involving overhead electric utility lines, and the Bloomfield, Conn., Public Works Department, which created a multiuse water truck by modifying an existing vehicle for $950. The Connecticut LTAP Center's Creative Solutions Program is one of the competitions across the country that inspired the national Build a Better Mousetrap Competition, said Martin. "In Connecticut, our Creative Solutions Program has become a way to recognize initiative and innovative thinking among our local public works agencies," said Connecticut LTAP Center Director Donna Shea. "They get excited about the opportunities we provide for them to share their solutions with their peers. You would be amazed to see how much creativity exists in this humble group of transportation professionals." For a booklet describing entries in the 2010 national competition, go to http://www.ltap.org/resources/mousetrap.php. For more details on the program, contact Susan Monahan at 202-289-4434 or smonahan@artba.org. Using good traffic management techniques during construction can help get the job done safely, on time and with less traffic disruption, according to speakers at a Federal Highway Administration Web conference on work zone assessment, data collection and performance measurement. Highways for LIFE and the National Highway Institute collaborated on the conference, part of the ongoing "Innovations" series. A recording of the online session is available at www.fhwa.dot.gov/hfl/resources/#webinar. "Effective traffic management during highway construction is key to minimizing unnecessary traffic and construction delays as well as making sure that workers and motorists are safe during construction," said Chung Eng, FHWA Work Zone Mobility and Safety Team leader, who moderated the online session. "But how do we know that the traffic management strategies we select during design are right for the job and that work zones are operating as efficiently as expected once the strategies have been implemented?" In spring 2010, a team of traffic experts conducted a domestic scan of work zone practices in 15 states to seek answers to those questions. The scan focused on four areas: safety and mobility performance measures state agencies use, how states collect data, how they use data, and how the data help states evaluate and improve their processes and procedures. A key scan finding is that executive management support for making work zone safety and mobility a priority is critical. "It seems simple, but it can't be emphasized enough," said Stuart Bourne, state traffic management engineer for the North Carolina Department of Transportation, who cochaired the scan with Eng. "Nothing happens in a state agency without support from the top. Data collection for work zones takes an investment of personnel, time and money, and that won't happen if upper management is not 100 percent behind it." Good traffic management in work zones can smooth the way to more successful highway projects. Also essential is early identification of the potential impacts of work zones. "The earlier, the better," Bourne said, making it possible to choose from more alternatives to mitigate work zone impacts and costs. "Quality and timeliness of work zone data are important," he added. Crash data, for instance, need to be accurate enough to properly identify crash trends. And they need to be timely enough that they can be used to tweak the traffic control plan before the contractor has moved on to the next phase of construction and the traffic pattern is different. Another good practice the scan team observed is setting goals and performance measures for work zones before collecting data. "This is important because if equipment is purchased or data collected before clear goals are set, the potential for wasted money and resources is greatly increased," Bourne set. Define where work zone impact assessment fits in the overall project development process. Successful agencies consider impacts throughout their processes, revisiting early assumptions and making refinements as project development progresses. Collect quality mobility and safety data in a readily usable format. The data should be accurate and timely enough to allow the highway agency to use it in decision making. Relate work zone performance measures to agency goals for mobility and safety. Work zone impacts on the traveling public are key considerations, but so are costs, productivity and environmental issues. Continually improve how data are analyzed and used to enhance agency processes and procedures. "For example, if your measurement is the number of work zone crashes, you need to consider the duration of the work zones and the specific work zone strategy being implemented at the time of the crashes," Bourne said. Before the Ohio Department of Transportation developed its 2000 work zone policy, highway projects routinely involved closed lanes and mile-long backups, said Reynaldo Stargell, traffic engineer for the Ohio DOT's Office of Traffic Engineering in his presentation on the state's work zones practices. Ohio is one of the states the scan team studied. The agency's procedures for projects now include developing a permitted lane closure schedule, a maintenance of traffic exception request, a maintenance of traffic plan, and—soon—a maintenance of traffic alternatives analysis. That analysis is designed to provide the Ohio DOT with information to determine which construction scenario is best and safest for a particular work zone. It also identifies potential problems early to give the agency time to address them before the design stage. "We focus on trying to get the kinks worked out in the maintenance of traffic for projects before we get to design," Stargell said. "It's cheaper to change things at that point. The closer you get to constructing the project, the more expensive and time-consuming it becomes to make any changes. To register for future "Innovations" Web conferences, visit www.nhi.fhwa.dot.gov/about/innovationseries.aspx.